Enjoy our range of interesting hydropower facts. Learn about hydroelectricity production, different types of hydropower, the largest hydroelectric power station in the world, the use of tidal power and much more. Hydropower uses the energy of moving water for a variety of useful applications. Hydroelectricity generates electricity by harnessing the gravitational force of falling water. In 2006, hydroelectricity supplied around 20% of the world’s electricity. 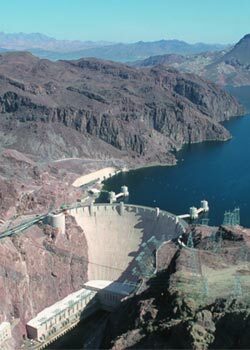 Most hydroelectric power stations use water held in dams to drive turbines and generators which turn mechanical energy into electrical energy. The largest hydroelectric power station in the world is the Three Gorges Dam in China. A small number of countries, including Norway, Canada, Brazil, New Zealand, Paraguay, Venezuela and Switzerland, produce the majority of their electricity through hydropower. Hydroelectricity is a renewable energy but the building of the large facilities needed to make it can have negative effects on the environment. Hydropower has been used to power watermills for thousands of years although cheap electricity has largely made them obsolete in modern times. The most common type of watermill grinds grains into flour. Tidal power is another form of hydropower, it uses the energy of tides to create electricity.